ARC Plasmet Corp. provides quality plastic fabrication for a number of industries, including unique projects within the wedding industry. 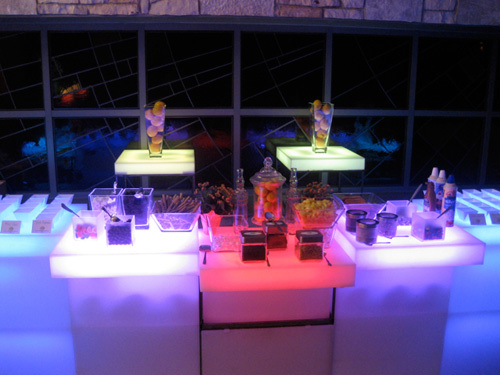 We were contracted by a customer to manufacture LED tables for a wedding event. This project required the fabrication of 20 plastic tables to be used with LED lighting, which we completed in just 2 weeks. We utilized our in-house panel saw to cut the natural polypropylene and acrylic materials. The finished dimensions of the tables were 8' in length, 4' in width, 3' in height, with material thickness of .5". Comprehensive dimensional and visual inspections were completed to verify dimensional accuracy and quality. This project is a small example of the unique products that can be manufactured utilizing our advanced fabrication capabilities. For more information on this project, or the processes used to fabricate it, see the table below or contact us directly.